I have to admit I’ve never been a huge fan of Six Feet Under. 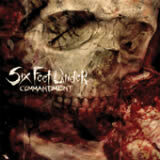 However, strangely enough Six Feet Under is the band that introduced me to and got me into Death Metal. The year was 1995 (or maybe it was ’96) and I bought a compilation CD from Metal Blade. It had a lot of really bad crossover bands on it but it also had an awesome Mercyful Fate song. Obviously there was also a Six Feet Under song on it, which was Enemy Within. The catchiness and simplicity of the song structure made the song very accessible for someone like me who was new to Death Metal. The simplicity of Six Feet Under’s music in general is also why I’ve never really enjoyed their music all that much. With a few exceptions here and there most songs I’ve found to be boring, bland, and uninteresting. With all this being said I must say that this release is the first Six Feet Under release that I’ve enjoyed from beginning to end at a reasonably high degree. The simplicity of the music has finally translated into decently memorable and catchy riffs with infectious rhythms that had me moving my head throughout. As previous releases have demonstrated Six Feet Under is a Death Metal band that focuses on groove rather than speed, and in that sense some slight comparisons can be made to Swedish Death Metal (I was actually reminded of Bloodbath every now and then). I couldn’t find one blast beat through the entire CD and gratuitous double bass is used throughout at varying tempos. Though too much double bass can result in blending songs syndrome it actually really is the best drum pattern for the majority of the groove laden riffs; especially those that have a Death/Thrash sensibility which shows up on more than one occasion. The tempos mostly plod along at just slightly above mid-paced; occasionally slowing things down and speeding things up but it never gets into doom or grind territory. The vocals are also appropriately placed and have the same type of tempo as the riffs and are actually quite decipherable. In fact, this is one of the few instances where a Death Metal CD has catchy choruses due in large part to the vocal lines. The songs are all rather short and are never long enough to induce boredom but due to similar tempos used in almost all songs repeated listens begged for more variation. The production job, like the song writing, is very accessible. The guitars are distorted and heavy enough, but it’s a fairly clean production job with a well produced rhythm section and appropriate mixes throughout. Where this release succeeds and other have failed lies in within all aspects of the music and production. Mainly, the riffs are actually interesting this time around, though not the most original. The song writing also lends itself to the aforementioned high degree of catchiness due to commonly found verse, chorus, verse, chorus song progression that also seems to use the most ideal drum pattern to back up any given riff. What this all means is that the music never challenges the listener or creates any kind of complex atmosphere or dynamics, but the simplicity is actually appealing for hte most part as opposed to snooze-inducing as before. Though please keep in mind this is still a Six Feet Under CD. They’ve have had the same mentality for the last 12 years but this is probably the first time they’ve turned that mentality into something worthwhile. Despite the tendency the music has to get my foot tapping or neck moving, closer listens showed a lot of repetition that is hard to ignore. The validity of this release might still be in question to some since Blood Red Throne essentially does the same back-to-the-basics Death Metal except with a harsher production job and more complicated rhythms and riffs. Some of you may still find this too simple to enjoy, while others will likely get brief enjoyment out of it when you’re just not in the mood to digest the complexity of something like Immolation or the brutality and aggression of something like Vital Remains. Worth checking out either way, especially if you’re new to the Death Metal genre.